Nine Steps to The Perfect Paint Job | DH Automotive, Inc.
Well, hello out there! “Where the heck have you been Daniel?! !” you’re probably asking, am I right? And as it’s been several months since our last installment, it’s a good question! To keep it short, life got in the way. The wife and I welcomed our newborn baby boy into our home! I won’t bore you with all the details, but I’ve been busy to say the least! At any rate, in the interim I’ve received an overwhelming number of requests from DIY paint enthusiasts asking what it really takes to go from rusty “barn find” to a beautiful painted vehicle. So what better topic for my next blog post than the painting portion of vintage auto restoration? That said, I’m going to launch right into the subject, focusing entirely on the technique as opposed to what particular products to use. All classic car painters out there swear by their favorite brand of paint and related materials, and quite frankly I’ve seen some amazing paint jobs done with a rattle can. So without further ado, here goes— my outline of a perfect paint job. The very first thing you want to do before you so much as lift a finger is start with a vision of the finished product. 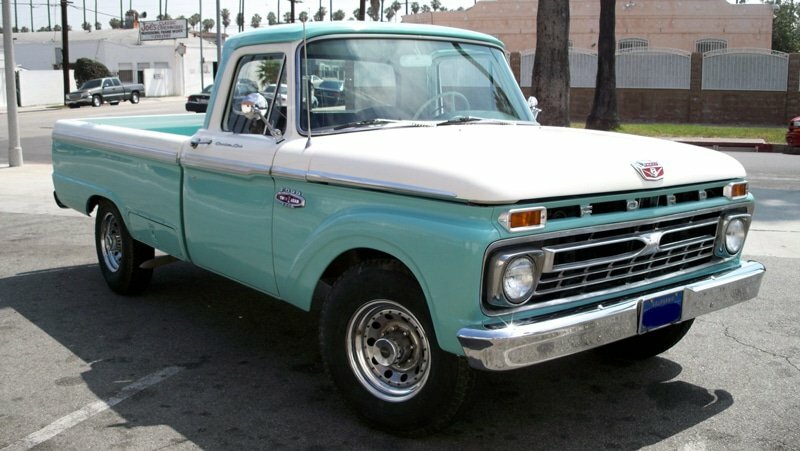 The best way to do that is by hopping online and searching for an existing restoration of your particular vehicle in the color that you’d like to use. Nine times out of ten you’ll find the very color you’re looking for, or something similar. Do not underestimate this step: taking the time to “visualize” the final product will provide you with a destination that will serve as a useful guide when you find yourself off track and will most certainly carry you through to arrival. This is the first step I take on every restoration I perform, and if I can’t find the car in a particular color that I like, I print the photos out in black and white. Also, if you are hung up on what color you want, you can ask your local paint shop if they can shoot a few samples to help with the decision process. Now that you’ve got a vision of the end product and you’re set on the color, it’s time to get to work with stripping down the car. This determines the kind of paint job you want. Obviously you want to do the very best paint job you can, so I recommend that you remove EVERYTHING. This will require removal of all chrome as well as the front and rear bumpers, and all trim including the hood trim, door trim, vent windows, door window scrapers, door handles, locks, etc. Quick Tip: Before doing all the above, I strongly suggest that you take photos of everything you plan on removing. That way, when it comes time to reassemble everything, you’ll have the perfect points of reference from your photos. This is another crucial step, and sadly most people wait till the car is already painted to do it. But this is the best time to line up the doors, hood, trunk, and to decide if you want to begin lining up the rear first and work forward or to take some other approach. This is the time to check to see if your door hinges are bad and need to be replaced. In the coming months, I’ll go into detail on how you align body panels but for now we will stick to the overall preparation. Quick Tip: Take a small drill bit and drill two holes in the hinge to use as a marker. When the time comes for reassembly, you’ll use these two holes as guides, saving you an enormous amount time and hassle. This is the most time-consuming aspect of the project, as it involves rust removal, dent removal, use of body filler, and removing old paint using paint stripper, etc. You want to take your time and work from the rear to the front, taking one section at a time. Sure you can. But it’s been my experience that leaving old paint on the car will cause problems down the line, especially in areas that see heavy use, like the driver-side door jams, trunk and hood areas, etc. It’s better to start with a clean slate. That way you can ensure that your paint job will last. Once you’ve removed the old paint, you want to clean the bare metal with a cleaning agent. You want a clean surface to work with. I’ve seen people use everything from lacquer thinner to brake cleaner for this purpose. Next, you want to apply etching primer—a thin coat— so that your body filler will adhere to the surface. 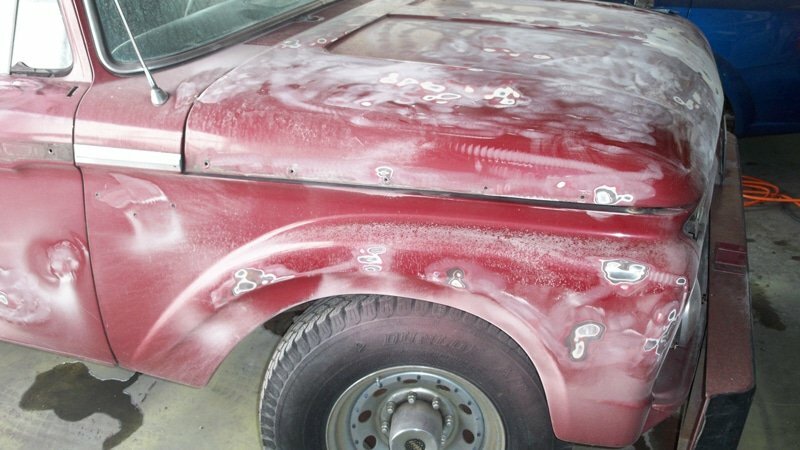 Once your body work is completed, it’s time to spray on the primer/sealer. This is a critical step that you don’t want to cut any corners on: there’s a huge difference between a “15-footer” paint job and a smooth as glass primo paint job, and it requires a great deal of time and patience to get the final product just right. You want to use a light gray or light yellow primer. Once the primer/sealer is applied and has had a sufficient amount of time to dry, you want to use a block. Blocks come in different sizes, from 4 inch to 18 inch. When you block or sand, you want to use a cross-hatch pattern, which means sanding from east to west, then coming back over the same area going north to south. This way you eliminate heavy scratches that will pop up once you lay down the paint. Also, you will want to use the “Guide Coat” technique, which means applying a mist coat of black paint over the light primer area. After that dries, use the cross-hatch sanding technique again, using wet/dry sandpaper grit 350, 400, 600, 800 and a bucket of water in order to reveal any imperfections. These usually appear after a few minutes. Deep grooves or scratches and low spots will stay black while the surrounding areas become gray or yellow. It’s important to use a light primer so that you can easily see the imperfections from the contrast from the black paint. After you’ve sanded down the high spots and taken care of the scratches, shoot water from a hose under florescent shop lights and look for any waves or slight dents that might reveal themselves. Now it’s time to play doctor. Think sterile, “operating table” clean: no dust, dirt, no wax or soap. To achieve this, begin with a good scrubbing with a light soap. Then, after a thorough rinse, use a air hose to blow out any of the loose water and debris from the cracks. If you don’t have air hose, I suggest you rent a portable compressor. Next, you’ll want to begin the masking. If the windshield was removed, you can use cardboard to take its place. This will save time and the cardboard will be rigid enough to hold up to the pressure of the spray gun when you apply the clear coat. You want to use 18-inch masking paper to create a skirt that attaches to the bottom of the body from the inner side to protect the drivetrain from over-spray. You want to use a combination of plastic and paper, especially if the drivetrain is left in the vehicle. In particular, pay close attention to exhaust pipes and exposed wires from the front or rear lights. Somehow these always end up getting painted. Whether you have a shop paint your car or do it yourself, whether you use solvent-base paint or water-base, single-stage or two-stage, you want first to apply several thin coats of paint rather than one heavy coat. This will allow any imperfections to come to the surface, especially if you choose a metallic color. The first area to shoot is the roof, then move down to one side, finishing at either the hood and the trunk. Keep in mind you want to keep the same distance from the gun to the surface and move in a flowing motion back and forth, starting from the ground up. Quick Tip: I apply two thin coats then allow them to dry completely—about a day. Then I go back over the paint with 800-1000 grit sandpaper to make sure all the imperfections are taken care of. Then, using a tack cloth, go over the entire vehicle, all the while checking the masking tape for clean adherence. The key here is allowing the paint to fully cure. Some argue that you should scuff up the clear coat inside of 12 hours to allow impurities to escape from the clear. I have found it’s better to just leave the paint alone. If there are any “runs” in the clear coat, you want it to be cured to avoid it tearing. Next, you want to use 1000-1200 grit wet/dry paper with a bucket of water. Quick Tip: Take a wooden paint stick, snap it into the sandpaper, then wrap the sandpaper around it as if it were a block. Start in the rear and move forward. Avoid the edges and high spots. Those areas will be taken care of with the wool pad—the next step. Along with the wool pad, you want get yourself a good rubbing compound. I suggest using 3M. Then, after cutting the paint (polishing the clear to a mirror finish), you want to go back over the car with a foam pad and a swirl glaze to remove the scuff marks made by the wool pad. The final touch is to apply a good Carnauba wax. Now it’s time to relax and slow down. Take your sweet time installing the bumpers. First, you might want to clean up the bumper brackets and apply a coat of gloss black, or take some polish to those chrome/stainless pieces you removed. Look into weatherstripping kits that will take care of all the important seals you will need. And there you have it folks: my nine steps to the perfect paint job! I know what you’re thinking: “Wow! This seems so easy!” And yes, I did gloss over some sections (pun intended), but I know it’s important to go from start to finish without getting bogged down in details.